Rob Maclean's team of the week: Kent, Edouard, Forrest and who else? 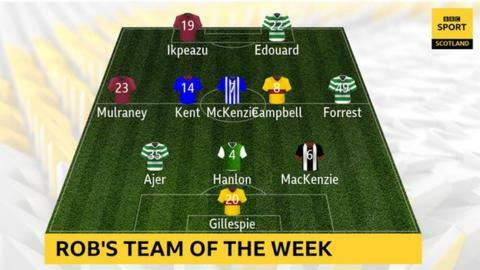 Odsonne Edouard, James Forrest and Ryan Kent cemented their places thanks to their goals in a stormy Glasgow derby, but who else features in BBC commentator Rob Maclean's team of the week? 3-5-2 formation: Mark Gillespie (Motherwell); Gary MacKenzie (St Mirren), Kristoffer Ajer (Celtic), Paul Hanlon (Hibernian); James Forrest (Celtic), Rory McKenzie (Kilmarnock), Allan Campbell (Motherwell), Ryan Kent (Rangers), Jake Mulraney (Heart of Midlothian); Uche Ikpeazu (Heart of Midlothian), Odsonne Edouard (Celtic). Motherwell's Mark Gillespie made a crucial save from Liam Craig's penalty after only 12 minutes against St Johnstone on Saturday. It paved the way for a fifth consecutive home win. Gillespie has been a top-class replacement for first-choice goalkeeper Trevor Carson. It was a bold move from St Mirren manager Oran Kearney to give Gary MacKenzie his first game of the season in Saturday's relegation crunch match against Dundee. But the gamble paid off and the 33-year-old defender was the cornerstone in a big win for the Buddies that hauled them off the bottom of the Premiership. I loved blood-stained Kris Ajer's air-punching reaction to his last-ditch sliding block, which stopped Joe Worrall grabbing a late leveller for Rangers in Sunday's Old Firm showdown. Celtic's 20-year-old Norwegian was a towering presence in defence. They have a prodigious talent on their hands. Hibs fans will reckon Paul Hanlon's first goal in almost exactly a year was worth waiting for. It broke the deadlock in a pretty dire match at Livingston on Friday night. Hanlon adjusted well to lash a left-footer into the roof of the net and played his part in a solid defensive show as well. James Forrest had quality and composure in equal measure as he stroked home Celtic's winner against Rangers to ease the Premiership leaders 13 points clear with seven games to go. That was his 21st goal of the campaign for club and country. Forrest has to be a contender for player of the season. Check out, if you haven't seen it, Rory McKenzie's disguised pass for the third goal on Saturday in the 5-0 hammering of Hamilton Academical that allowed Kilmarnock to climb into third place in the Premiership. It summed up a top-notch performance from the often-underrated midfielder. Motherwell youngster Allan Campbell is another player who probably doesn't get as much credit as he deserves. Team-mates David Turnbull and Jake Hastie have been the headline-makers of late, but Campbell's creativity in midfield, allied to his usual energy, was one big reason behind the 3-0 weekend win over St Johnstone. Rangers livewire Ryan Kent should have earned a red card for lashing out at Celtic captain Scott Brown and will surely face retrospective action. It's a shame the flashpoint overshadows a top-drawer performance from the on-loan Liverpool winger that included a brilliantly-taken sixth goal of the season. Jake Mulraney was a big player at left wing-back for Hearts on Saturday in what was a pretty dramatic Tynecastle turnaround against Aberdeen. Mulraney's 60-yard dash at the heart of the Dons defence produced the penalty from which the Jambos equalised and his direct running was a threat throughout. Hearts striker Uche Ikpeazu was another constant menace to the Aberdeen defence and, ultimately, the visitors failed to handle his pace and power. He should have had a penalty when he was wrongly booked for diving, but he had the last laugh when he swatted aside Andy Considine and Scott McKenna to slot the winning goal. There were lots of sideshows going on at Celtic Park on Sunday, but starring on centre stage was Odsonne Edouard. The 21-year-old Frenchman was cool and clinical in scoring the opener - his fourth goal in five Old Firm games - and showed poise and awareness in setting up the winner. A class act.